It’s a full weekend of West as both the first and women’s teams are back in action. Saturday see’s the return of a fan favourite to the Recreation Ground as Ash Woods and Trafford are the visitors. 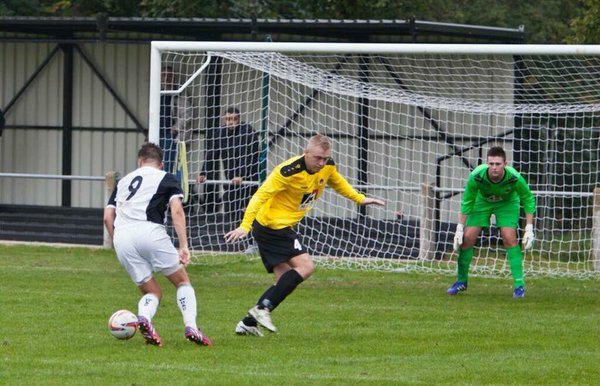 Ash Woods, 24, joined the club in 2015 scoring on his debut against Atherton Collieries on the opening day of the season as a substitute. In his first season he would go on to score 20 goals in 34 appearances as he was nominated the Supporters Player of the Season. Ash began last season in red hot form notching 17 goals in the first three months of the season before he left for Trafford. For Trafford, Woods scored 7 times in 24 appearances before returning to West for the final week of the season scoring twice more and going onto sharing the golden boot with Matty Kay. Trafford were formed in 1990 as North Trafford and were admitted into the NWCFL in 1992 where they were promoted to the Premier Division at the second attempt in 1994. Changing their name to Trafford in 1993 it took them just three seasons to reach the Unibond going up as champions in 1997. They were relegated back to the NWCFL in 2003 before reaching the Evo-Stik league a second time in 2008 again going up as Champions. Since then they’ve been an ever present in the Evo-Stik as well as enjoying two seasons in the Premier Division in 2013/14 and 2014/15. Last season they finished in 6th place as they narrowly missed out on the play offs on the final day. A number of West players have represented both clubs in the past including Chris McDonagh, Martyn Andrews, Matty Kay, Joe Shaw and Nia Bayunu who holds the distinction have having captained both sides. Kick-off is 3pm and it’s the last home pre-season game before the season kicks off with West on the road until the visit of Widnes on the opening day of the NWCFL season on August 12th. If that wasn’t enough the Women’s team are in action on Sunday as they travel to Blackburn Community, 2.30 pm KO. It will be a tough test for Manager Paul Caddick’s side as Blackburn Community finished last season strongly on their way to a 7th placed finish on in the NWWRFL Premier Division.